We are up and out early in order to catch the train from Waterford to Limerick. It’s an easy ride for a few hours on mostly flat terrain. Several queries are sent off to AirBnB hosts in Limerick since we plan to spend two nights in the city and there is no convenient camping. We are on a new schedule. 3 days biking then two nights in one place so we have a full day to catch up on emails and other work. I have a rather large backup of work since I remain responsible for Green Olive Marketing, web site management, and finances - even while on the bike tour. The original idea was to bike for 4-5 hours each day and devote 2-3 hours for administrative work on the laptop and phone. It’s just not happening very efficiently so setting aside a dedicated day every 3 days will solve the problem. Sunita also needs to take more time to develop new music arrangements, prepare for her whirlwind 4-day tour to Somerset Harp Festival (USA), and catch up on her blogging. 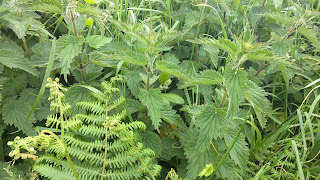 We have realised that one of the primary connections between Brittany, England, Wales, Ireland (and likely Scotland), is Ferns and Nettles. They line the highways, byways and woodlands of all these countries. 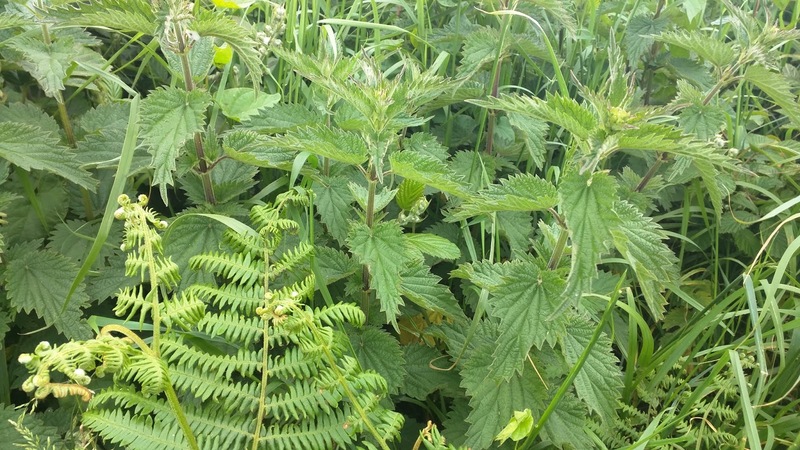 Thanks to the native Dockin’ leaves that usually grow next to nettles, the occasional sting is soon taken care of by rubbing the leaves on the sting. Waterford is a surprise. I was expecting a sleepy coastal town and instead found a bustling small city along the busy River Suir port. The Vikings founded the city in the 9th century! 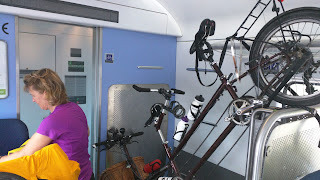 We found the railway station and while Sunita hid outside with the tandem, I went in to buy tickets. The sour-faced lady at the ticket booth looked at me suspiciously as I purchased two people tickets and one bike ticket. “Is it a normal bike?” she asked. “I think so” I replied. Tandems are perfectly normal for us. 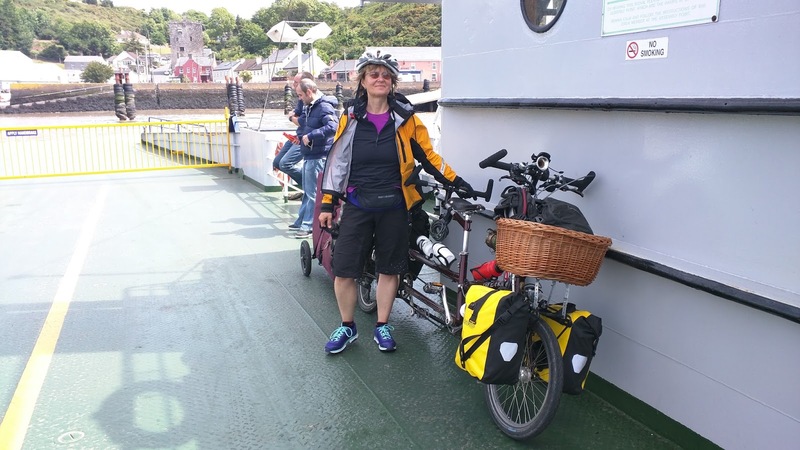 I return outside and then a railway man in uniform pokes his head out the door and we assure him that the tandem is really quite small and the harp trailer detaches. Then before further questions can be asked, we scuttle off into town to have lunch by the river. A skinny fellow walks up to our bike and makes some nice comments so we engage him in conversation. He notices that our lunch does not include meat or dairy products and it turns out he is also vegan. Pretty soon he is giving Sunita his phone number and offering his front lawn for camping in case the train officials turn us away. They didn’t. 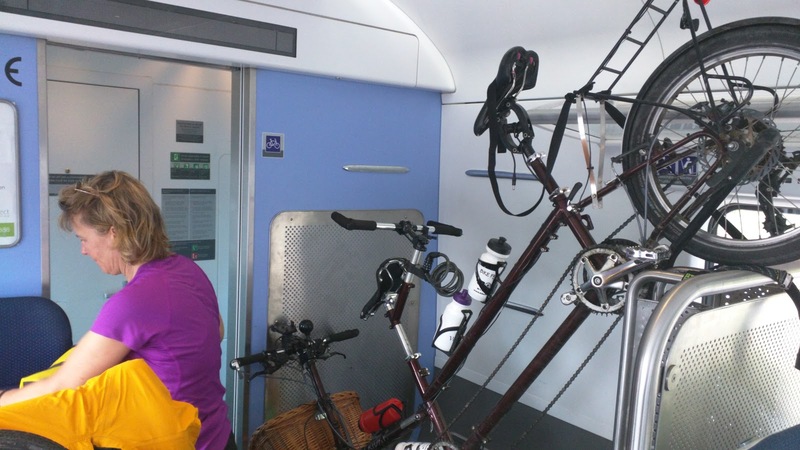 Getting on the train was painless and seamless, although we had to do a little gymnastics in order to hoist the bike into the 1.3 meter space provided. It was a lovely train ride through the countryside to Limerick. Even the change at Limerick Junction went smoothly.The Irish are very efficient at trains. Off one train, 5 meters across the platform and on the next train - all accomplished in 2 minutes with the station staff helping with the bags. Good on you - Ireland! 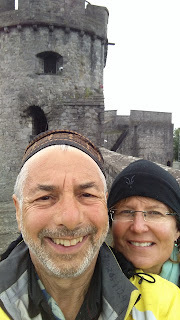 Once into Limerick it was just a 25-minute bikeride to meet our hosts Itzi & James. 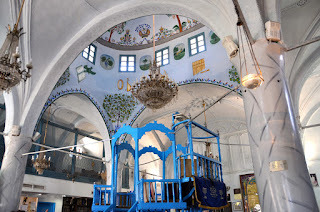 They are a lively pair with two young boys, Rubin and Daniel. Itzi originates from the Basque region of Spain and James is a local, and a musician who performs in a rock/pop band and works in musical education for underprivileged children. They are fun, dynamic, opinionated, and have a good sense of humour. We have found some kindred spirits and settle in for a two-night stay. Next morning I am up at the crack of dawn, and hard at work as the sun comes up. Finally some progress on the Blog and website updates. It feels great to be productive. There’s a steady drizzle of rain. The bike is getting a good washing but I will not be able to do the needed maintenance. As Sunita does her writing, I pull out my string. String? In another life (1970s) I was a macramé artist. This of you who have been to my home have seen a few of my pieces. So I brought some raw material (the string) on this trip and plan to create a new work. I spend an hour or so organising the colours and cutting the string so that I can begin the project. We are tourists for a while and take a walk into town to see King John’s castle, which was built in the 13th century on an island in the River Shannon. The site itself goes back to the 10th century when there was a viking settlement there. King John ordered the castle built and it remains one of the best preserved Norman castles in Europe. We pay our 10 EURO (each) and take the tour. The multi-media presentations elaborated on the complex history of Ireland. 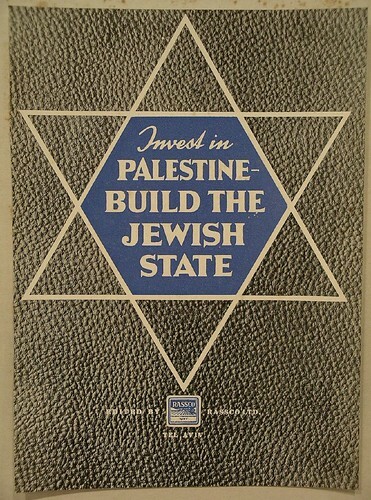 Like our home in Israel/Palestine, the Irish story has many complexities and unusual twists and turns. We left the castle a little wiser. I had resolved to go to bed early in the evening and packed all our gear by 9pm, ready to load and leave in the morning when we were schooled for a short train trip to Ennis. I cam downstairs to say goodnight to our hosts when a good friend of theirs showed up, and a bottle of wine opened. Well the first bottle turned into a second bottle then a third. As the wine flowed, the conversation took off, and a convivial party ensued. It was midnight before I got between the sheets .